Political activist, political prisoner and President of the PAC. Clarence Makwetu was born on 6 December 1928 in Hoyita, in the Cofimvaba district, Transkei. He was the second of five children of Minah and Gqongo Makwetu. After passing Standard Four at the local school he moved to Keilands Mission in the Stutterheim district where he completed Standards 5 and 6. From 1943 -1945 he attended a local school in Queenstown, studying for his Junior certificate. In 1946 he went to Lovedale near Alice for his matriculation. Makwetu was drawn into the political struggle by the Defiance Campaign of 1952 organised by the African National Congress. He joined the African National Youth League in 1954. He was part of the breakaway faction from the ANC which form the Pan Africanist Congress in March 1959. Makwetu supported the breakaway faction because of its commitment to restore the land to its rightful owners, the African people. Makwetu as PAC branch secretary at Langa, New flats was instrumental in leading the marchers on Defiance Campaign for having to carry their passes. After the declaration of a State of Emergency on March 30 1960, Makwetu was detained from March to September 1960 when he was released. During this period the PAC was banned. In August 1961 he was arrested in Cape Town and escorted to Transkei where he was banished. A month later he was again detained from September 1961 to February 1962. After his release, he returned to Cape Town, but was arrested and sent back to Cofimvaba. In April 1963 Makwetu was once again arrested and charged with furthering the aims of a banned organisation, the PAC. He was tried at Engcobo, Transkei, and sentenced to Five years imprisonment. On his way to Robben Island he was taken to Stellenbosch to face further charges but was acquitted. After serving an effective sentence of 5 years, Makwetu was released from Robben Island in 1968 and taken back to Transkei where he was restricted for two years until 1970. He found employment near Qamata as a clerk with a building firm earning R39 a month. He obtained a plot of land linked to an irrigation scheme and began crop farming. In June 1976 Makwetu was detained without trial and released in May 1977. He was arrested in July 1977 by the security police in Queenstown and was taken to Pietermaritzburg, Natal until his release in November 1977. He was also arrested by the Transkei Police in July 1979 and detained until October of the same year. In December 1979, Kaizer D. Matanzima, banished him to the Libode district for 5 years until October 1984 when he was allowed to return to Cofimvaba. But his presence remained a threat and he was detained again in August 1986 for 4 months. 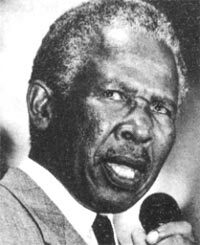 In December 1989 he was elected leader of the Pan-Africanist Movement (PAM), front organisation of the PAC. After the unbanning of the PAC on 2 February 1990, Makwetu was elected President at the party’s congress on 1 December 1990. He succeeded Zephania Mothopeng who died on 23 October 1990. In February 1991 Makwetu and Nelson Mandela addressed the Harare Meeting of the Frontline states, the Organisation of African Unity and Liberation movements. During 1991 Makwetu held talks with the ANC and the Azanian Peoples Organisation (AZAPO) in an attempt to forge a patriotic front in order to unite the liberation movements. After 1994 election Makwetu was one of the three PAC members in parliament. In 1996 while still President of the PAC, he was expelled from the party for bringing the party into disrepute. Divisions emerged within the PAC with those calling for more vibrant leader outnumbering Makwetu’ supporters. He subsequently lost his position in parliament to Rev. Stanley Mogoba, who was elected party president in December 1996. Makwetu is married to Mandisa and the have two sons. They live in Cofimvaba, near Queenstown. • Gastrow. S. (1992). Who’s Who in South African Politics: Volume 4, Johannesburg: Ravan Press.